Out of all the business college courses I teach, Marketing is by far my favorite. Because I own a small business marketing and consulting firm, I suppose this makes sense. I can bring more real life stories and experiences into my Marketing class than any of my other courses. Plus, Marketing is a deep passion of mine. But with this passion comes an even deeper frustration. 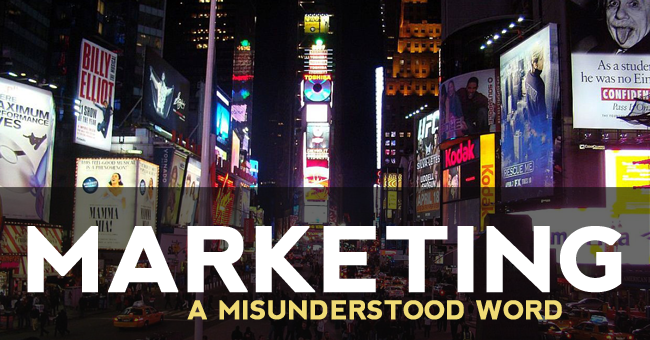 In my opinion, “marketing” has to be one of the most misunderstood words in the modern English language. Perhaps I exaggerate a little in this statement but regardless, “marketing” is a concept that has been muddied, changed, ran over, and revived for years. Every business owner on earth knows that they need marketing, yet I find even the textbooks get the real purpose of the word wrong. I have heard and read a lot of different definitions of marketing over the course of my career. Most are long, drawn out, boring, even confusing attempts at trying to nail down all the complexities of marketing into one meaningful (or not so meaningful) statement. Academia further complicates the issue by throwing Research and Development, Supply Chain Management, Sales, Real Estate, and sometimes even Operations into the marketing mix. Each one of these areas are vitally important to business, but they each have their own unique needs, skills, and systems. I think it’s unfair and over complicated to throw all this under the marketing bus. As a business professional, I have had opportunities to explore and manage virtually every aspect of business and the so called marketing mix. I have been in Research and Development, Supply Chain Management, Sales, Real Estate, and Operations and I can assure you none of these had anything to do with marketing. Sure, marketing holds little value if you fail at any of the other areas…but that’s another article coming soon. For me, marketing is a lot less complex than we have made it out to be. In a nutshell, I would define marketing as the process of getting people interested in what you have to sell. I tell my students that Marketing has nothing to do with selling: it is simply the act of finding people to sell to. For me, the things that fall under the banner of Marketing are branding, reputation, education, consumer research, and advertising. Keep in mind that marketing has no value if you don’t have the right location, or the right product, or a supply chain to get the products to the customer, but I still don’t thinks it’s fair to lump these things into marketing. Marketing is all about finding people interested in what you have to offer, nothing more and certainly nothing less. The bottomline is that you can’t sell anything, no matter how good you are at selling, or how great your product is, or how efficient your supply chain is, if no one walks into your store, finds your website, or gives you a call. This is the purpose of marketing, to create a message, brand, and reputation that allows you to get in front of potential buyers. I will dive deeper into this in the coming articles. We will examine each of the areas I identified as branches of marketing (branding, reputation, education, consumer research, and advertising).